After my last wordy post, I'll leave you with images from my garden after the rain. The hydrangea has blooms that are turning leathery with age and brand new ones still forming. A metaphor for life? We have to enjoy the last of summer blossoms. In no time at all the petals will start changing colors and the weather will change. We will all be missing the beautiful colors of summer. 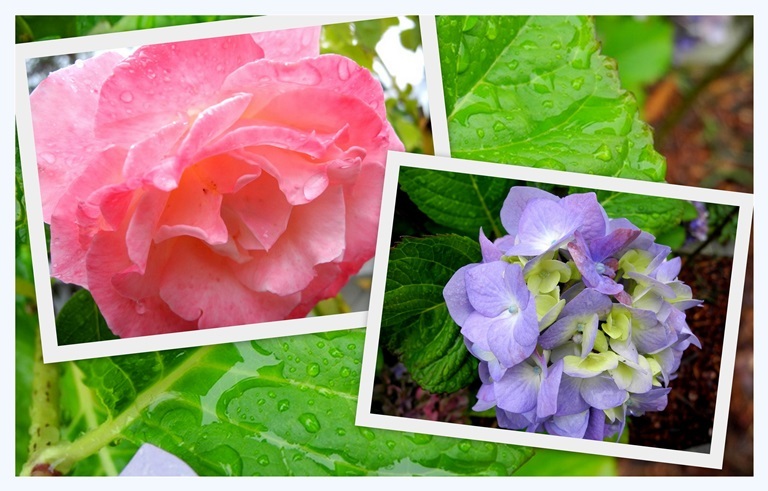 I'm humming the song as I enjoy your pretty flowers, a nice collage to feature them too. Beautiful - have just come to you from reading a blog about hot days with temperatures in the mid 90s so this was really cooling! I know which kind of hydrangea blossom I am but as you say life's like that!! My hydrangeas are just beginning to change colour too. The blue ones turn the most amazing pink, surprisingly. Beautiful images. But I really love the story in your previous post. Our memories are such a blessing... they tie us together with ourselves and others and our experiences. It is so interesting some little thing will trigger a memory. bright copper kettles and warm woolen mittens......lovely! The previous post is wonderful. My hydrangeas are now turning from white to a lovely pink, their fall colours. We can learn from metaphors. The photos are beautiful; raindrops on roses really are one of my favourite things. Lovely... love raindrops on roses!